. . . compelling . . . Ashkenazy's performances of these pieces by Shostakovich document the fruits of an unique artistic relationship between composer and interpreter, here shared with new generations of both performers and listeners . . . [Piano Trio no. 1]: Though conceived in a sole movement, the music undergoes many transformations as the Trio progresses, and each metamorphosis is wrought by these musicians with musical and dramatic sensitivity . . . As played by Ashkenazy, Visontay, and Lidström, the Trio is an attractive introduction to Shostakovich's chamber music and an enjoyable piece in its own right . . . [this DECCA recording of Shostakovich's Piano Trios and Viola Sonata allies the esteemed pianist Ashkenazy] with three accomplished colleagues in performances of music that surely holds special significance for him. These performances are sure to hold special significance for listeners fortunate enough to hear this disc. That Ashkenazy in his late seventies is still playing, conducting and recording is a cause for quiet celebration. This reading of the weighty Piano Trio No. 2 . . . [is] intensely affecting, aided by three string players . . . The trio's glacial opening is chilling here, Ashkenazy wisely remaining in the shadows, and his subdued, plain delivery of the slow movement's bell-like chords reminds us to concentrate on the string lines . . . [Piano Trio no. 1]: it's a real find. All the composer's stylistic tics are present, the bittersweet first theme among the most delectable things he wrote. Marvellous stuff . . . [Viola Sonata]: Eloquent, spare music, its case is winningly made by violist Ada Meinich. She and Ashkenazy are superbly poker-faced in the last of the composer's throwaway scherzos. The closing Adagio is extraordinary . . . Especially poignant is the reappearance of the main theme from the early "Suite for Two Pianos". The ending is a heartbreaker . . . Decca's cover photo is a winner, showing the composer sneaking a cigarette on the night train from Moscow to Leningrad. The intensity of Shostakovich's music is matched by the captivatingly intense performances of these extraordinary musicians . . . Here we hear it all -- the pain, turmoil, despondency, soaring, playfulness, raggedness, tenderness and radiance. These musicians bring out every colour, every nuance, every motif with astounding conviction and utmost respect for the great composer. [Piano Trio 1]: Ashkenazy and his colleagues bring out its lyrical qualities to the full, with no shortage of momentum where required.
. . . [generous and insightful notes are] provided for the three recorded works . . . [Piano Trio no. 1]: a work well beyond its student years, which Ashkenazy and his colleagues deliver with consummate style and a clear regard for its standing . . . [Piano Trio no. 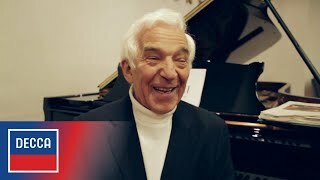 2]: Ashkenazy and company provide a darker, more powerfully characterised and knowing performance, which brings not only greater rewards, but a finer sense of the work's formal and spiritual structure. This is nowhere more evident than the leap in mood from the depths of the "Largo" to the Klezmer jollity of the "Allegretto" finale's opening; music of an expressive range that is surely in Ashkenazy's blood, and in his hands it suddenly all makes sense . . . [Viola Sonata]: Meinich's warm and velvety viola together with Ashkenazy's sonorous pianism brings not only sumptuous results, but a quite sanguine outlook that underscores the work's richness of invention . . . [the recording is] forwardly balanced but very realistic, with the hall's ambience more of a backdrop than a distraction. This is Decca sound in the best traditions of the house . . . The effect of the recording, as with the performances, is enthralling and immersive.
. . . [Ashkenazy's playing] is as interpretively astute as ever . . . they cruise smoothly through the 13-minute Trio no. 1 . . . [the group then tackles Trio No. 2, and here Ashkenazy communicates] a bone-weary spiritual depletion, and the Klezmer-inflected finale builds to a grinning dance of death. . . [on Shostakovich's Viola Sonata, the musicians] capture perfectly its valedictory spirit. The studio recording is close-up with warm, resiny string tone. [Shostakovich / Piano Trio 1]: this new performance is as good as the few others I've encountered . . . [Shostakovich / Piano Trio no. 2]: to my ears what's distinctive here is the beautiful, natural recorded sound and the equally beautiful playing by German-Hungarian violinist Zsolt- Tihamér Visontay, concertmaster of the Philharmonia Orchestra, and Swedish solo cellist Mats Lidström . . . [this new performance comes close to approaching Shostakovich's] compositions as pure music . . . Each movement stops short of editorializing . . . listeners may appreciate a reading that focuses primarily on beauty and ensemble precision . . . [Shostakovich 2/ Viola Sonata]: Meinich has a rich, singing tone, and the recorded sound is just as impressive as elsewhere on this disc. The performance has few sharp comers and achieves a simple eloquence without despair. For once, what might be called judicious underplaying works to the music's benefit, or at least this listener's enjoyment. Everything about Trio 2 goes right, especially the lonely and forlorn cello harmonics of I, Ashkenazy's skeletal, chattering piano commentary, and the stomach-churning, precipitous string crescendos of II. Their approach is brittle, searing, not romanticized at all, emphasizing the dissonant grotesque elements, and all the more harrowing and moving by contrast with the earlier trio . . . [Viola Sonata]: Ashkenazy plays with clarity, minimal pedal, and insight rather than comforting beauty . . . This is an exceptionally moving concert, a journey from the plush, romantic Trio 1 to the stark minimalist Viola Sonata. The sound is lovely: close and intimate. Wonderful recordings . . . Ashkenazy and co perform with the required combination of anguish, anger and playfulness.
. . . [Shostakovich / Piano Trio no. 1]: persuasive . . . there is a largeness of scale and gravitas in the reading by Ashkenazy et al that is powerful in its own way. What really sets their recording apart, however, is the extraordinary realism and immediacy of the sound, the distinct definition of the instruments, and the exceptionally clear texture . . . [Shostakovich / Piano Trio no. 2]: There is a satisfying sense of linear continuity and an anguished lyricism in the playing . . . Clarity and detail are again exceptional . . . [the playing of Ashkenazy and his collaborators] conveys a profound grieving and achieves a wrenching climax . . . The performance brings out the rage and bitterness of this music with powerful impact . . . [overall, I would place this new recording] at the top of the pack . . . admirers of Shostakovich 's chamber music should find this release very rewarding, because of its excellent performances and superior sound quality.
. . . le pianiste russe unifie l'album par son intelligence rythmique et son impeccable contrôle de l'architecture . . . [Shostakovich / Piano Trio no. 1]: nos trois interprètes soulignent les métamorphoses de climat de cette page très rhapsodique dans ses tempos mais d'une densité extrême . . . [Shostakovich / Piano Trio no. 2]: Dans chacun des quatre mouvements, et notamment la passacaille du largo médian, épicentre émotionnel, Ashkenazy et ses complices développent un discours grave, irréel et nocturne . . . [Shostakovich / Viola Sonata]: Ashkenazy touche juste par sa hauteur de vue, sa grandeur presque aristocratique. Il installe un équilibre singulier dans son dialogue énergique avec un alto solide, pénétrant et discret.